, a celebrated printer of Lyons, in France, was a German, and born at Suabia, near Augsburg, in 1493. He performed the duties of his profession with so much honour as to receive the approbation of the most learned men. Conrad Gesner has even “dedicated one of his books, namely, the twelfth of his pandects, to him and takes occasion to bestow the following praises on him” You, most humane Gryphius, who are far from meriting the last place among the excellent printers of this age, came first into my mind: and especially on this account, because you have not only gained greater fame than any foreigner in France, by a vast number of most excellent works, printed with the greatest beauty and accuracy, but because, though a German, you seem to be a countryman, by youV coming to reside amon<r us.“Baillet says, that Julius Scaliger dedicated also to him his work” De Causis Linguae Latinae:“but this seems a mistake. Scaliger wrote a kind letter to Gryphius, which is printed at the head of the work: but the dedication is to Silvius Scaliger, his eldest son, to whom he also addressed his” Ars Poetica." 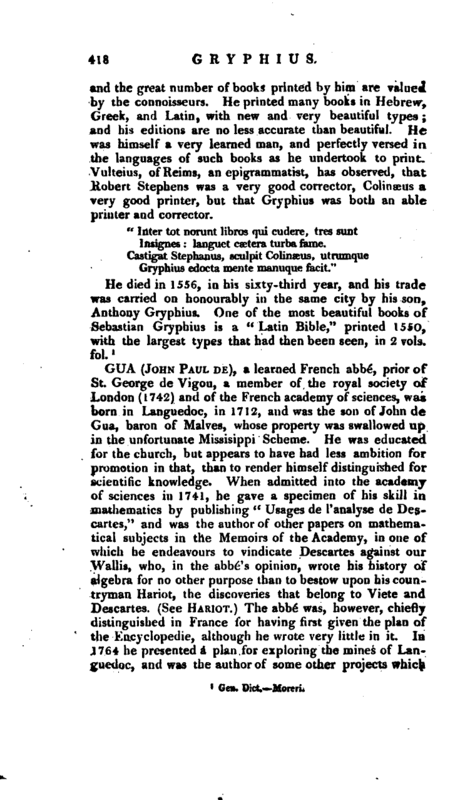 Gryphius is allowed to have restored the art of printing at Lyons, which was before exceedingly corrupted; | and the great number of books printed by him are valued by the connoisseurs. He printed many books in HebreV, Greek, and Latin, with new and very beautiful types; and his editions are no less accurate than beautiful. 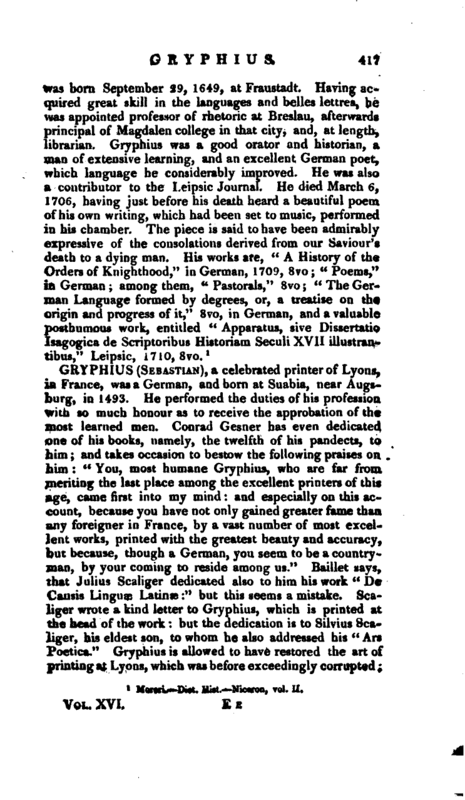 He was himself a very learned man, and perfectly versed in the languages of such books as he undertook to print. Vulteius, of Reims, an epigrammatist, has observed, that Robert Stephens was a very good corrector, Colinaeus a very good printer, but that Gryphius was both an able printer and corrector. Insignes: languet caetera turba fame. Gryphius edocta mente manuque facit."